Yes, we're all sick of the endless parade of flankers, but sometimes a flanker is a welcome thing. Annick Goutal launched the original Mandragore Eau de Toilette in 2005, and I was among many who complained about its lasting power. Despite that, I eventually bought a bottle and I do wear it quite happily in summer. Later, Annick Goutal released an Eau de Parfum version. As expected, it had better longevity, but it also retained the woody-herbal crispness — perfect for hot weather — of the original. As advertised, the new Mandragore Pourpre is stronger, darker, spicier and more aromatic than the original Mandragore. There are flashes of the original's citrus and minty greenery in the opening, but almost from the start, it's done in a darker, more mysterious cast, with fruity undertones and lots of peppery spices: it has less of an outdoorsy, herbal feel. The base is a very clean woody patchouli with just a hint of incense (the notes: bergamot, mint, star anise, amber, rosemary, geranium, black pepper, patchouli, myrtle, incense and heliotrope). Again as advertised, it should hold up to winter wear better than Mandragore. Still, it is by no means a heavy fragrance, in fact, it's considerably lighter than it probably sounds. Several times while wearing it, I got the almost-subconscious impression that I was wearing something from L'Artisan Parfumeur, if that helps anyone — Mandragore Poupre would fit nicely into their Les Epices de la Passion series, and if your experience with Annick Goutal has been confined to the more feminine florals, it may come as something of a surprise. As for me, I like it, even like it very much, but I haven't yet decided if I love it. It took me two years to decide I needed a bottle of the original Mandragore, so perhaps I'll do a slow burn on this one too. Annick Goutal Mandragore Pourpre is available in 100 ml Eau de Toilette, and is sold in the square bottle for men or the gadroon bottle for women (the juice is the same, so pick the bottle you like best). The lasting power is reasonable for an Eau de Toilette, and much better than Mandragore's, but it still isn't a powerhouse of longevity. For buying information, see the listing for Annick Goutal under Perfume Houses. 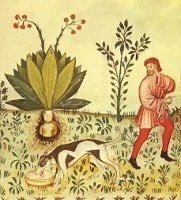 Note: second image is Mandrake (Mandragora officinarum), scanned from 15th century manuscript Tacuinum Sanitatis via Wikimedia Commons. 1. For more information on mandrake plants in the Harry Potter series, see the entry for Mandrake at the Harry Potter wiki. I was already eagerly awaiting this one; now I’m feeling downright impatient. With your description, I could almost justify an unsniffed purchase…but I won’t do it. Hope it shows up at my Nordie’s soon! Don’t buy unsniffed! I know Aedes is getting this one eventually, and probably Nordstrom too. Ah, I could troll the Aedes site too I guess…just hoping for Nordie’s since I could drop by as opposed to ordering a sample. Agree I wish they’d kept the original men’s bottle… but at least I have the original in that bottle (albeit a mini). Oh, a mini in that bottle must be adorable! Lucky you. That sounds lovely and the purple bottles are just wonderful. Is anyone else wondering if this formulation was a result of the review in Perfumes The Guide (something about the original not being witchy enough considering the name). If I had to guess, I’d guess it was more due to customer interest in a heavier version, but who knows? Thanks for this! I’ve been VERY eagerly awaiting this, though I still have a lot of original Mandragore left. Is it already on Nordies shelves? If Pourpre is quite different, it sounds almost as if I might like the EdP better, but I get the impression that’s very hard to find. Mandragore is something I knew I wanted to own the moment I smelled it — it was one of “those.” Such a terrific green scent, which I’d rank up there with Profumum Victrix, a discovery I made early this year (and which is a bit heavier and more aromatic-herbal with lots of bay laurel). I thought it was hard to find too, but Beautyencounter has the EdP at a very good price. So far as I know, regular retail stores in the US only got the Butterfly bottle, at least, I never saw the regular EdP bottle anywhere. I love the original Mandragore, and this sounds really wonderful too. I find that I only wear Mandragore in summer; this one sounds like something I might wear in winter too. On a side note, I was in an Anthropologie the other day and noticed they are now selling several Annick Goutals, including Mandragore (the original one). That was a surprise to me since I haven’t seen AG there before! I saw that on the Anthropologie website! Didn’t see them in my local store though. Seems like an odd fit to me, don’t know why. Yeah, I thought it was a little odd too. The AG line looked out of place to me next to the other lines they carry, though I’m not sure why. For one thing, way more upscale, no? Most everything else they have in fragrance is pretty “cheap thrills”. Yes, I think that’s it! I think of AG as more “high-end” than their other stuff. It certainly is more pricey. Then again, that new DS & Durga stuff will be going for something like $48/18ml? (wow, I had to 2x check that… yowza!) Maybe Anthropologie is going for a range and not just “cheap thrills” anymore. Oooh, you got to try this one already! I’ve been watching Aedes to see when this might show up. I like the original and I also really like Poivre Piquant from the L’Artisan Les Epices series, so more pepper and spices sounds great. Robin, did this strike you as having more patchouli than you’d like, or is it clean and light enough that it isn’t overwhelming? No, the patch is very clean — not earthy or sour or musty or any of the other things patch can sometimes be. Actually, I think I would like MP better if the base was a little earthier than it is. I am eagerly awaiting this one. Ever since the initial mention on the blog a while back, I’ve been pestering my local Nordie SA’s with “Has it come in yet? !” I really like the original, but like everyone else, no lasting power at all. And I adore the color. The color is great! I really loved the original men’s bottle for Mandragore, wish they’d kept it for this one. Will definitely have to give this a sniff. Or two. And the packaging is beautiful. Question: Am I the only person who will not purchase a fragrance I actually like if the bottle is heinous? Yes, I know I can hide the bottle somewhere after putting on the juice but part of the appeal for me is absolutely the bottle – and it can’t be fug. Usually I’d say I’d buy anything I love no matter how hideous the bottle, but there are a few exceptions. I won’t buy Omnia because of the plastic outer shell — I do demand glass at the very least! And if I’m wavering, a great bottle will push me over the brink. I agree – it’s all part of the indulgent pleasure. Like having a beautiful mug to drink your tea out of, it increases the wonderfulness of the experience by including the other senses in it. Conversely, ugliness can mar the pleasure. Sayitisntso, I didn’t buy CDG Carnation (Red Series) just because I disliked the bottle. I’m getting fussier about bottles, and have even grown to dislike my Montale Aoud Rose Petals just because of the bottle! On the other hand, even a superb bottle won’t make me buy something Ii think is “meh”. You could always decant them into some kind of swanky Baccarat thingie! At this point, I own so many decants in generic atomizers that I don’t really care! Not that I’m beyond drooling over a beautiful bottle. My thoughts exactly, Robin! I’ve had that happen to me a time or 20. You think to yourself “Well, it’s soooo purdy. And if God didn’t want me to have it, He wouldn’t let me see it! !” Ahh, the things we do to justify our ‘addictions’! I thought Mandragore edt was perfectly nice, but not quite green or herbal enough for me. Might need to at least sniff this one (hey, I LIKE clean patch, at least to a degree!) – and my 14-year-old, who is a big Potterphile and who likes less emphatically-girly scents than I do, might really enjoy the Purple Variation. Hmmm… Christmas gift? I’ll think on it. This is very emphatically not girly. Not what I’d think of for a 14 year old, but perhaps she’ll love it — in which case, hey, you’ve got a perfumista on your hands! I haven’t let a bottle put me off yet – maybe I would though if it was a very expensive scent and bottle was garish and cheap looking. I don’t know though – all my bottles are stored in their boxes, so I only look at them when I put the frag on. I’d probably be more put off by something that was hard to hold and/or spray. A pretty bottle can definitely tip me over the edge though. Mine are all in a cabinet. Too lazy to keep them in the boxes though. Seriously, I’m so lazy that if I tried to keep things in their boxes I would never wear them. Plus, more than half of what I own never came in a box to begin with (bought used or tester) that it wouldn’t help much. Let’s put it this way – the stuff that came in a box and doesn’t have an opaque bottle are all in boxes (which can be annoying at times). The decants and unboxed stuff are just in the cabinet. I really need a bigger cabinet – but one that is shallow enough to only hold a single layer. Definitely looking forward to trying this one out. Thanks for the review, Robin. There has been this veritable hole in my perfume desires lately…seriously, there was really nothing that I *wanted* to buy for the first time in like 2.5 years!! I’m just sitting here, lazily trolling through all the fragrance sites, and then POW. Thanks for the tip. This Mandragore Pourpre (say that with peanut butter in your mouth!) sounds like just the ticket to brighten up my fall fragrance forecast!!! I have both the original in edp and a mini in the edt. I like them both for yucky summer days to brighten things up (and yes! it is a very “family friendly” scent as I just discovered over the weekend.) But I am interested in something from AG that is not a floral – I like Sables, but not enough for a whole bottle. And none of the orientals worked for me at all. This one sounds like an excellent addition to my AG wardrobe…and I just adore that men’s bottle!!! Thanks Thanks Thanks!! Oh, now that’s so much pressure — I do hope it works for you! Hi AnnS, I’m wearing Sables today and I’m struggling to stop myself from scrubbing it off! Am I missing something? Because to me it smells like a sweaty a@$ crack! Please excuse the visual and crude language but it’s the first thing that popped into my head upon first and every subsequent sniff. Not for nothing, but it you want to try something with a similarly rich structure but not so syrupy (or skanky), you should test the Sonoma Scent Studio Tabac Aurea which is a gorgeous warm pipe tobacco, spices, leather, amber, labdanum concoction that is very similar in form to Sables, but supremely wearable and totally divine. AnnS – I think the real reason is that I have an extremely underdeveloped nose and cannot detect these subtle nuances and structures, or basically, I know very little about this world of perfumery! I reckon in 12 months I’ll be testing Sables again and I’ll probably feel completely different about it. I don’t think Pondichéry has even made it to the US yet, officially, so don’t feel bad! oh thanks, Joe! I didn’t realize…..
It’s true, I have not laid eyes on Pondichery! Crikey! It’s made it to Australia. That must be a first. I think these were initially geared at Asia & travel retail…so no surprise the US is last! Oh no–I see the howling mandrake root from “Pan’s Labyrinth”! It seems like it will have a gigery feel to it–an astringent pepperiness. I was afraid to see that movie, but hear it was excellent! It is fabulous, but quite cruel. Worth it, though, for the imagery and story. I usually don’t make it through movies like that, even if they’re wonderful. So won’t try. I loved the original Mandragore and somehow missed the release of the EDP. I may have to order a sample of this since I do love the original and wish it was a bit deeper and longer lasting. I’ll also have to price the EDP, too. As far as bottles go, I find the bottles for L’Arte di Gucci and La Perla Eclix absolutely hideous, but adore their contents too much to forego a purchase on account of them. The LAdG bottle reminded me a bit of a bat wing when I took it out of the box, but one spritz (I’d only dabbed up to that point) and I didn’t care. Do see the EdP price at Beautyencounter, it’s less than $60. I did not shop around at all though…maybe it can be had even cheaper somewhere else. I don’t currently own ANY AGs (oh wait, forgot that I purchased that rollerball of Matin d’Orage unsniffed a few months ago…still haven’t worn it). Anyway, I wore Hadrien years ago. Loved it. Also had Eau de Charlotte, which I remember as very powdery, soft, and feminine. Wore Le Jasmin for a short while, but traded it away. Other than that, I know little to nothing about the line. I sniffed most of them in Bloomingdale’s about 10 years ago. Not impressed enough to buy any. And here in the parfum wasteland of Maine, I don’t have the opportunity to hop over to my local Saks and try them out. I suppose in my mind, AG is not at the top of my must sniff list. I’m much more compelled by L’Artisan. Is there anyone out there who’s passionate aboug AG? Is there a “must try” out there that I should bother to seek out? I don’t know about passionate, but I really like the line. They aren’t like L’Artisan — many of the older scents are feminine florals, not unusual so much as very well done. My favorite of those is still Le Chevrefeuille. They’ve also done a few oddball scents that are worth seeking out to try: Sables, as mentioned above, and Eau de Fier, which unfortunately you can only buy in Paris. But I do think they do a very solid job & Isabelle Doyen is a wonderful perfumer, and as with L’Artisan, I want to try whatever they make. Thanks, Robin. If you’re comparing AGs to L’Artisan, then I must give them another try. Sounds like I need to schedule a trip to Boston. Actually chatting with sacrebleu in western MA that perhaps we should get a New England contingent to meet up in Boston for a mini sniffapalooza!!! I don’t think anybody has done an event in Boston, go for it! Hi Karin. Start with AG’s Heure Exquise and stop looking. Ok just kidding, but it is a drop dead gorgeous iris, rose, and sandalwood. Totally stunning. It is one of my HG’s so I am always happy to recommend it. Otherwise I like the other big ones from AG: Ce Soir ou Jamais, Grand Amour, and then Mandragore and Eau d’Hadrien. oh my goodness. I’ve been kind of offline for the past few days. I want this NOW thanks very much. Don’t know which I like more the Mangradore EdP or the Mangradore Pourpre. I need to get a sample of it, so that I can try them for longer. Eau de Charlotte EdP and Eau de Camille also smell gorgeous. I think I still like the original best. I really love this one. I have tried it on my skin a couple of times and I think maybe this may be my first purchase of 2010.
oops, now I am confused as if it is the original or the M. Pourpre that I am in love with. Another excuse to go to the fragrance boutique! LOL…and perhaps you’ll need both!